The World of Gord: Braised Beef Short Ribs, Crock Pot Style! Braised Beef Short Ribs, Crock Pot Style! Teena got a new book, Best of Bridge, Slow Cooker Cookbook, and has made a few great recipes from it. Today was my turn. It was a great day to do it as it is the first day for the NFL. This way I could make up supper in the morning and it would be ready for when the games are over. I chose to do Braised BBQ Short Ribs. 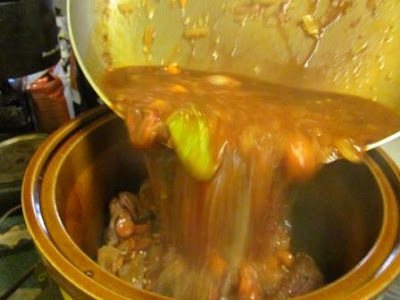 Use a 5- to 6-quart slow cooker. Season ribs well with salt and pepper. In a large skillet, heat oil over medium heat. Add ribs in batches and brown on all sides. Transfer to slow cooker. Drain all but 1T (15ml) fat from skillet. 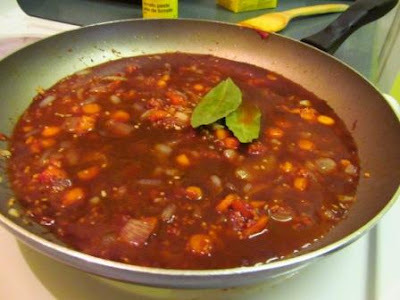 Add onions, celery and carrot to skillet and cook, stirring occasionally until tender and lightly browned, about 6 minutes. Add garlic, thyme and tomato paste. Cook, stirring, for 30 seconds. Stir in vinegar (it will evaporate almost immediately). Stir in broth and bay leaves. Cover and cook on low for about 8 hours or on high for about 4 hours, until ribs are very tender (the meat might fall off the bones before the end of the cooking time but this doesn't mean the ribs are fully tender). I cooked them on low, giving them time to cook during two NFL games. After watching my Green Bay Packers agonizingly lose to the Forty-Niners, it was time to transfer the ribs to a plate. Take out the bay leaves out of the left over sauce. Then using a spoon, remove as much fat from the surface of the sauce as possible. Stir in lemon juice and adjust seasoning with salt and pepper, if desired. It says to serve the sauce over the ribs and sprinkle with parsley. Instead I put on egg noodles and poured the sauce over it. The recipe says this dish serves 4 to 6, but there was no meat left when we were done. It's a great recipe and if you have a slow cooker, give this a try!